Remember that chicken bone broth we made a couple days ago! All you need to do is take a portion of that broth, add some of the chicken that you used to make the broth as well as some vegetables, pasta and… wholla! You have homemade chicken noodle soup! Doesn’t it make you want to just cuddle up on the couch with a blanket and good movie? 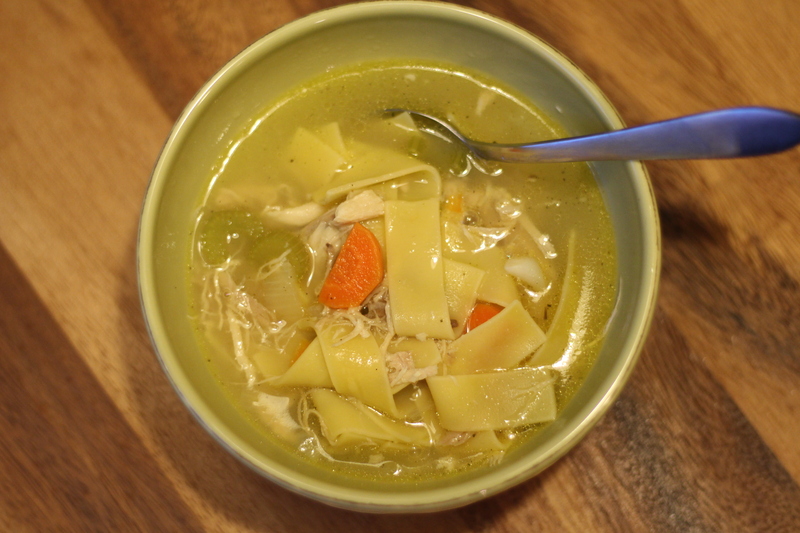 If you have never made chicken noodle soup before, now is the time to start. You really don’t know what you are missing. The store-bought version(s) really don’t hold a candle to what you could create in your own kitchen. Now go make some! Heat chicken broth on large stewing pot. Add cooked chicken, chopped onion and bay leaf. Simmer about 20 minutes. Add carrots and celery. Simmer another 15 minutes or until the carrots are just tender. Add egg noodles – approximately 2-3 cups, depending upon your preference. Cook per package instructions. Serve immediately so noodles do not get soggy. Freeze remaining soup for another cold, winter day!